FootprintXchange: ‘Who are the Storytellers now?’ is the first in a series of events where we will be exploring the Value of Design over the course of 2017. FootprintXchange is a hosted event with guest speakers, followed by discussion with the wider audience. It offers an informal arena to meet and engage with fellow professionals from business and commerce, academia, and subsidised sectors. Xchange focuses on subjects that impact our shared futures within the entertainment, theatre, retail, branding and events sectors, with discussions often leading to new, exciting collaborations and projects. In this session, we will explore the hot topic of who are the Storytellers now? Aside from sharing latest insights in immersive audience and brand experience, we will question whether technology enhances or hinders storytelling for artists, designers, producers, brands, and retailers. 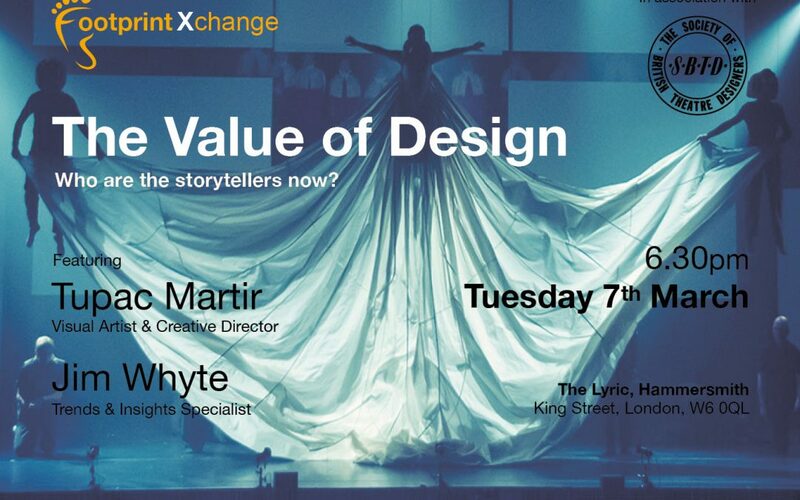 We are partnering with The Society of British Theatre Designers to bring you an engaging evening at Lyric Theatre Studio, Hammersmith on Tuesday 7th March 2017. Doors open 6.30pm. The SBTD are a professional association supporting and celebrating the diverse range of design for performance made nationally and internationally by UK based designers. Tupac is a multimedia artist, visual designer and creative director, specialising in light, who has provided production design, visuals and lighting direction for Elton John, Sting, New York Festival of Light, Xu Bing at the V&A Museum and the Serpentine Gallery. Tupac is known for creating unique multidisciplinary productions from several art forms including two of his own ‘Nierka’ and ‘Looking Outside My Window’. Jim is a futurist and trends expert who specialises in turning new technology and emerging patterns of behaviour into opportunities for brands. He has worked with clients such as Starbucks, Ford, Unilever and HSBC, helping them to adapt and thrive in a world of constant change. Previously Head of Trends and Insights at WPP agency FITCH, Jim is now a consultant working in numerous markets worldwide. If you would like to come to this free event please RSVP to rachel@footprintscenery.co.uk and let us know if you or a colleague can attend.